Dentil Trim - Carton of 8. 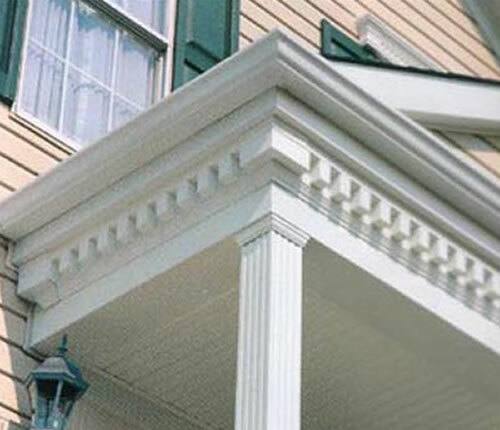 Why not add a touch of distinction to the outside of your home with our totally weatherproof exterior coving dentil trim? Available in two distinct styles; Classic square tooth or Scalloped tooth finishes. 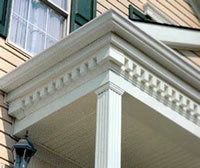 Simply Shutters exterior dentil is built to last from tough and durable copolymer polypropylene and U.V. stabilised to ensure that the whites stay white and will not yellow over time! Available in all the decorator colours of our shutter range plus an extra Bright White, this product is rapidly finding favour with independent customers, tradesmen and retail outlets. Buy it here and get it delivered to your door. Each dentil length is 1220mm long and 174mm high (48” x 6¾”) and is sold in cartons of eight lengths or individually. End cap sets, interior corners and exterior corners are available as part of the product range to give a professional finish every time.